Thanks to The Italian Gardener, I’ve been experimenting with vegetable planting. In November last year I planted several new varieties in my above-ground steel tubs. 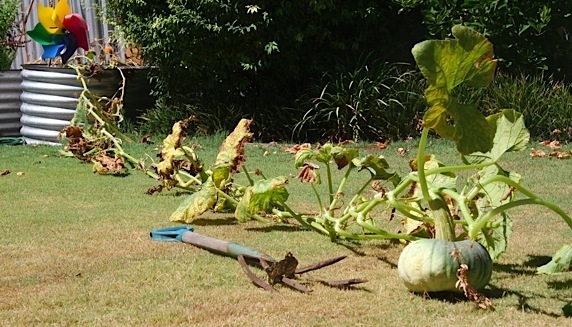 One of the pumpkin seedlings grew like a weed, sending out runners way too long for the venue I had chosen. I pushed them into the garden bed on the side of my lawn. Two flowers on the smaller runners were fertilised early in the season, and produced slightly unusual fruit which didn’t ripen properly. A third pumpkin, which formed right at the distal end of the main runner, only started to swell in the New Year and is developing very nicely as I write. One specimen, on the end of a 10 foot-long stem. I’m calling it umbilical pumpkin.